First introduced in 1982, the Beaufighter was basically a continuation of the 412 with some slight styling tweaks like quad lights. The main change however was these had their coachwork built at the Bristol factory. The 412’s were shipped to Zagato in Italy before having that brutal body work draped on. When the 412 was first built in 1975 the styling would have been fresh however when it went out of production in 1993, and to be honest through most of the 80’s, the styling was looking very dated. However as with all Bristol’s it’s what underneath that count, in this case a 350bhp 5.9ltr V8 with a Rotomaster turbo bolted on for good measure, that gave this car a top speed of 150mph and 0-60mph in 5.9s. Now numbers of cars built are unknown although it’s thought to be only 29, this though is not unusual for the secretive car builder who refused to allow test drives by journalists and didn’t advertise. When I saw one recently, the one below in fact, the first thing you notice is just how big the thing is which makes those performance figures even more impressive. This car certainly has presence, its waistline is about 6”’ taller than you think it will be when you walk up to it and that interior has all the luxury and leather you’d expect from a bespoke and high value builder. 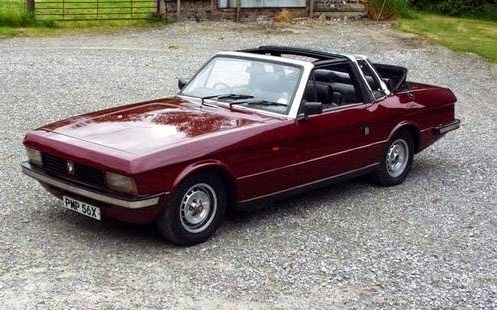 This is the definition of the Grand Tourer in the late 70’s, I mean just check out that half drop top built for the potential American ban on convertibles that was thrown around at the time.